We are true experts when it comes to automotive wheel alignment. Our auto technician team is educated, experienced, and efficient. Our auto repair facility boasts the latest equipment and tools. Not only do we have excellent equipment, but we also have exceptional hands to yield them. On average, our auto technicians have been working for Jack’s Auto Service for 10+ years. We think that speaks for itself. Jack’s Auto Service is proud to serve the beautiful community of Grand Rapids. For over 40 years, we have built a reputation as being a leading the auto repair center. Over the years, we have discovered a passion for specializing in wheel alignment. Many of our clients come to us with issues regarding their tires and wheel alignments. Even other auto repair centers send wheel alignment referrals to Jack’s Auto Service because they know we have the proper equipment and skills to get the job done right. 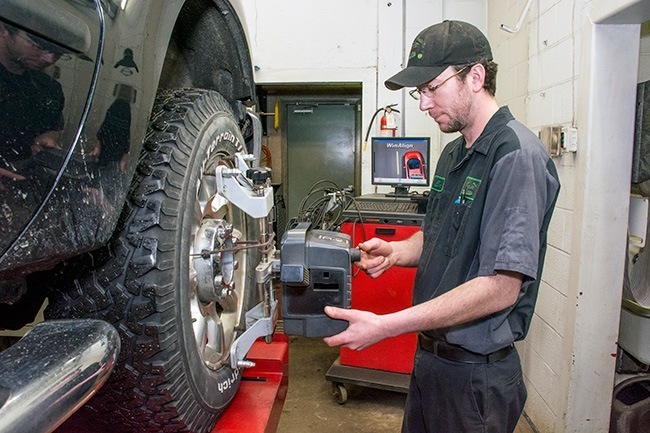 When it comes to wheel alignment, we stand behind our work. We are the leading wheel alignment expert in the Grand Rapids region, and there is no wheel alignment issue we cannot handle. Period. If your personal automobile or fleet is in need of wheel alignment, maintenance or repair, we invite you to Jack’s Auto Service in Grand Rapids. You can trust our friendly and experienced staff to get your car, truck, minivan or SUV driving its best!